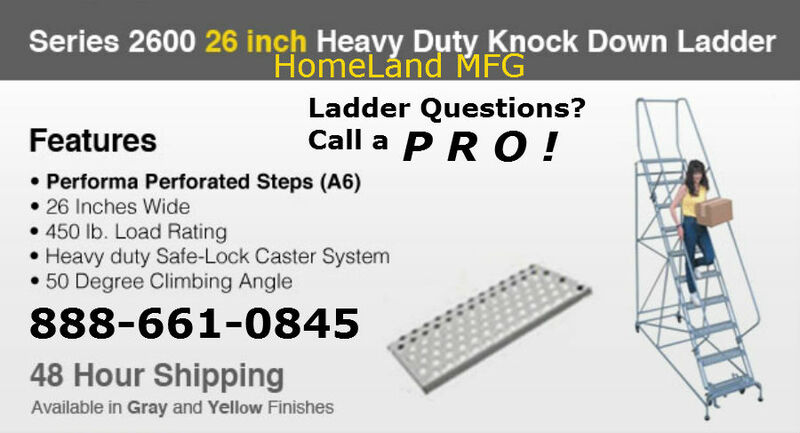 Cotterman Series 2600 is the Cotterman Heavy-Duty Rolling Ladder. With SAFE Forward Descent Too. 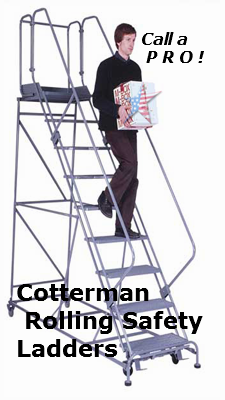 The SAFEST Way to Carry Inventory, Tools, a Products Up/Down Stairways is the Cotterman Series 2600. Cotterman Series 2600 for High Traffic or Industrial Environments. 450 lb. Rating! Cotterman Series 2600, are designed to withstand the abuse that is encountered in high traffic or industrial environments. Cotterman Series 2600 ships disassembled and has a 50 degree climbing angle. This Warehouse Rolling Ladder has larger 1¼" diameter tubing used in the base and in the vertical back panel. In addition, these ladders are rated at 450 lb. capacity. The steps are 7" deep, with 12" top step standard and an optional 24" deep platform is available. The series is offered in nine to fifteen step models. 12-step and taller ladders ship skid mounted. The ladder is powder coated with high gloss powder. Pick your color from our 11 stock choices. Treads can be Selected for highest slip resistance, expanded metal mesh or Grip Strut for heavy industrial environments. The Cotterman Safelock system is standard on all ladders. • 450 lb. load rating exceeds OSHA ANSI requirements. • Larger 1 1/2o.d. tubular base and back. • 7" steps and 11" top step available in three tread types. • The Series 2600 meets or exceeds OSHA 1910.29, ANSI A14.7.